The Rigg Design Prize takes place every three years at NGV Australia. The Rigg Design Prize is a generous legacy of the late Colin Rigg (1895−1982), a former Secretary of the NGV’s Felton Bequests’ Committee, and is awarded to an Australian contemporary designer displaying outstanding creative achievements in design. The invitational prize was established in 1994 to recognise contemporary design practice in Victoria. In 2018, for the first time in the award’s twenty-year history, the revitalised Rigg Design Prize included ten shortlisted designers from across the country in response to Australia’s burgeoning design culture. Award recipients Hecker Guthrie created a custom-made interior inspired by the one modestly unassuming object in our domestic lives that has an invisible gravitational pull, a pull that binds its occupants in space, our practice celebrates the ‘table’. “When deconstructed, the resulting fragments are elementary; a flat surface and one or more supporting structural components. Unintentionally, our domestic lives seem to almost orbit around this one singular object; it’s the place we live (eat, drink, play, gather, converse, work, create). In all its forms, the table principally frames all our daily gestures. As one of the collaborators working with the Hecker Guthrie design team, the studio responded to these ideas with a series of sculpted ceramic forms that act as symbols of the objects encountered in a domestic interior. 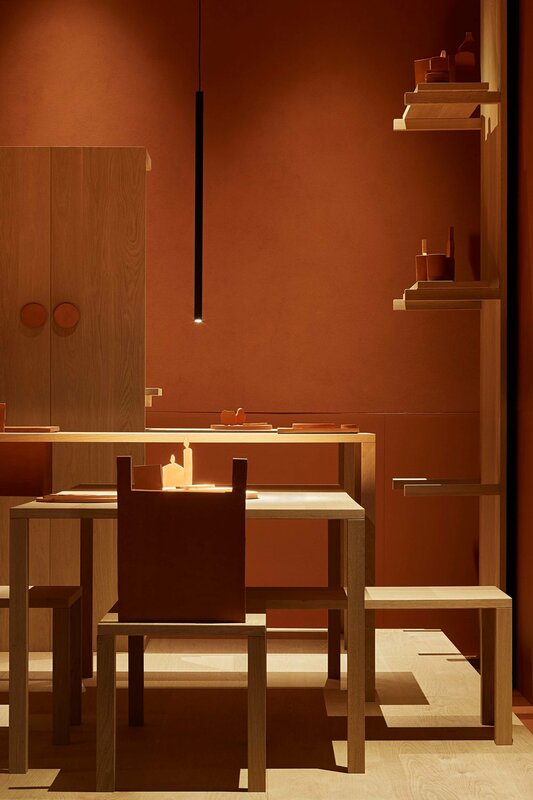 A range of domestic forms were sculpted from Australian terracotta for the final room, all made to integrate with the raw oak tables made by fellow collaborator Lowe Furniture. Terracotta is a ubiquitous earthenware clay body that is accessed across the globe in interior spaces and the built environment. We encouraged the elemental beauty of the claybody to emerge through a process of simplification and abstraction in the resolution of the forms. The Rigg Design Prize 2018 is generously supported by the Cicely and Colin Rigg Bequest. The exhibition is free and on display from 12 October 2018 – 24 February 2019 at the Ian Potter Centre: NGV Australia at Federation Square.